Erect perennial, originating from North Africa and the Mediterranean, with thick, very succulent, dagger shaped 30- 80cm long leaves, encircling a thick, central stem. The oldest and largest leaves are at the base, with leaves in the centre of the rosette formation being younger and smaller. Mature leaves can be 2-2.5cm thick and 6-10cm wide at the base, gradually tapering to a point at the apex. The upper leaf surface is flat or slightly dish-shaped and the lower surface rounded, with both surfaces being smooth to the touch. However, the margins of the leaf are armed with firm, spreading, triangular-shaped teeth 2-4mm long. Leaves on mature plants are a distinctive grey-green, due to the surface being covered by a greyish bloom, although during summer they can be greener and during winter they can take on a bronze tinge. I personally feel the plant colour depends a little on fertility and moisture available to the plant. New young plants, called pups or suckers, develop near the base of the parent plant as it grows to a good size or to maturity, which may take 2-4 years, depending on climate and growing conditions. Leaves of young pups tend to fan sideways and are pale green with white spots. The spots and fan shape disappear as the pups become older. 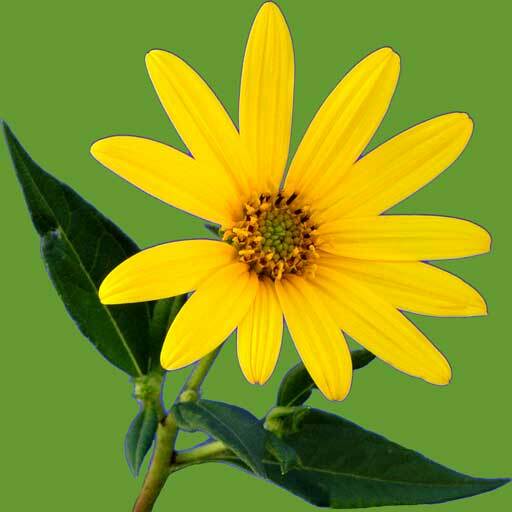 Flower stalks develop from the main stem of the plant and stand upright, reaching a height of 60-90cm. They may have 2-3 terminal branches and poker-like blossom heads 5- 8cm long, made up of many pendulous tubular flowers with a green tinge that changes to bright yellow at maturity. Pistil and stamens protrude beyond the end of the petal tube, which is an identifying feature of this species. Another identifying feature of A. vera barbadensis is that when the leaf is cut, the sap has a strong smell. Man has used aloe for over 5000 years. Egyptians first wrote of the healing powers of the plant on their ancient papyrus texts calling it the plant of immortality. Cleopatra and Nefertiti bathed in aloe juice to retain their youth and beautiful looks. Aloe is mentioned several times in the Bible. It was used in the burial of Jesus. History and legend tells that Aristotle convinced Alexander the Great to conquer the island of Socotra in order to collect aloe plants to use as medicine for his soldiers. Greek writer Dioscorides made detailed accounts of aloe’s uses. Aloe’s influence spread far and wide. In our century, we have the opportunity to read numerous books, hundreds of scientific papers and search the internet to discover the many benefits of aloe. Research studies highlight the tremendous healing powers of aloe when used both internally and externally. Some of the benefits include: as a pain and allergy inhibitor, for inflammation, fluid retention, perspiration odours, itching, hemorrhaging and to close cuts for cell regeneration and healing, to destroy parasites, harmful bacteria and fungi in the intestinal tract, to relieve bowel tension and help produce bowel movements, moisturise skin, increase blood flow, remove toxins and dead tissue, penetrate skin to reach tendons, muscles, joints and the lymph system, and promote the growth of new tissue. It also has a normalising action on fluid levels and the acid/ alkaline balance in the body. Research has shown that aloe vera can increase the proliferation of lymphocytes and stimulate natural immunity through killer cell activity. Aloe has a strong effect on the immune system, by activating and stimulating macrophages, monocytes, antibodies and T-cells, as well as increasing the number of anti-body forming Bcells in the spleen. One of the most important functions of aloe is to aid the digestive system, as poor digestion can be responsible for many diseases. Our food comprises proteins, carbohydrates and fats that must undergo a process of digestion, which consists of breaking down complex substances into simpler ones so they can be absorbed and used by the body. Aloe is able to assist the body by providing the active properties of a large range of amino acids, monosaccharides, fatty acids and enzymes that act as catalysts in breaking down complex foods so the body can assimilate the nutrients more efficiently. Considerable in-vitro and in-vivo research has been done with the concentration of mucopolysaccharides (MSPs) found in aloe vera. MSPs are long-chained sugar molecules, which are found naturally in every cell of the body, however, around the time of puberty, the body stops producing them. When taken internally, they have been shown to have immune stimulating effects. The MSPs of aloe vera interact with the body’s immune system, enhancing rather than over-riding this system. MSPs interject themselves into the cell membranes of the body resulting in much greater cell fluidity and permeability, allowing toxins to flow out of the cells more freely and nutrients to flow in. These nutrients include electrolytes and water, so the MSPs are able to facilitate absorbtion in the gastro-intestinal tract. The overall effect on the body is a rise in energy and cell metabolism activity which leads to a feeling of wellbeing. MSPs also act to protect cells from invasion by microbes such as viruses by setting up a protective barrier, which forms a lining on the colon and keeps toxic wastes from entering the body. MSPs will also lubricate the joints and relieve pain by dilating capillaries, which increases the supply of oxygen and blood to the area. Aloe vera’s properties are extraordinary and have been used to treat man’s many ailments from A to Z. Its uses and the conditions it may relieve include: abscesses, abrasions, acne, allergies, AIDS, anemia, arterial insufficiency, arthritis, athlete’s foot, asthma, bad breath, baldness, blisters, bed sores, bladder infections, blood pressure, bruises, bronchitis, burns, bursitis, bunions, bed wetting, boils, bone fractures, candida, canker sores, cancer, carbuncles, cataracts, cramps, chilblains, chemotherapy side effects, chapped skin and lips, coughs, colds and cold sores, colic, constipation, cystitis, conjunctivitis, colon cleanser, complexion enhancer, chicken pox sores, lowers serum cholesterol, convulsions, chronic fatigue syndrome, diabetes, dandruff, dysentery, depression, dry skin, dermatitis, denture sores, detoxifier, duodenal ulcers, oedema, Epstein Barr virus, earache, fevers, fungus, frost bite, fluid retention, gastrointestinal problems, genital herpes, gangrene, gingivitis, glaucoma, gynaecological diseases, gall ailments, heat rash, headaches, hemorrhoids, heart burn, high blood pressure, hang-overs, hives, heat exhaustion, insomnia, ingrown toenails, indigestion, insect bites, inflamed joints, jaundice, kidney infections, leprosy, laryngitis, lupus, liver ailments, leukaemia, lacerations, multiple sclerosis, mouth ulcers, moles, migraines, menstrual pain, nausea, nervous stress, nappy rash, obesity, psoriasis, prostatitis, pancreas problems, pimples, problems caused by protozoa (ringworm, fungi, virus), prickly heat, periodontal disease, radiation burns, rashes, scar tissue, skin lesions, stings, styes, sprains, sores, scalds, stretch marks, shingles, staph infections, sunburn, sore throat, stomach ulcers, sports injuries, sinus, sun spots, spurs, tonsillitis, tendonitis, trachoma, tuberculosis, tiredness, tropical ear, ulcers, vaginitis, venereal sores, varicose veins, worms, worts, wounds, X-ray burns, yeast infection and zoster (shingles). Aloe vera has six antiseptic agents (sulphur, lupeol, salicylic acid, cinnamic acid, urea nitrogen and phenol) which act as a team to provide antimicrobial activity thus eliminating many internal and external infections. The pain relieving action is due to the effective analgesics in salicylic acid, magnesium and lupeol. Fatty acids also have a pain reducing, allergy and inflammation relieving effect, and work to lower harmful cholesterol levels. Researchers have found that aloe vera applied externally has the ability to reach the deepest body tissues, penetrating some seven layers. Research at the University of Texas showed that aloe penetrates human skin almost four times faster than water. A friend, Joyce, who has discovered the many benefits of aloe vera says, “If it hurts, stings, itches or burns, put aloe vera on”. Apply the gel from the leaf immediately for burns and scalds, insect bites, nettle stings, chilli burns, pain in general and for quick healing. For external use, a fresh leaf can be cut open with a knife and the gel applied to the skin. When wiping the aloe leaf directly on the skin, all the sap can appear to have been used up, but if you take a knife and score the inside surface of the leaf with a few cuts, more juice will be released. Dose: As a general tonic, aloe vera can be taken regularly for stamina and well being. Cut one or two large leaves from the base of a plant, and allow to stand half an hour for the yellow sap just under the skin to drain. Take care not to get this sap on clothes, as it can stain. To make an infusion from the leaves, cut them into 2cm chunks and place the pieces into half litre size glass jars with lids (or other containers), filling the jars about one third. Top up the containers with cold water and put them in the refrigerator. 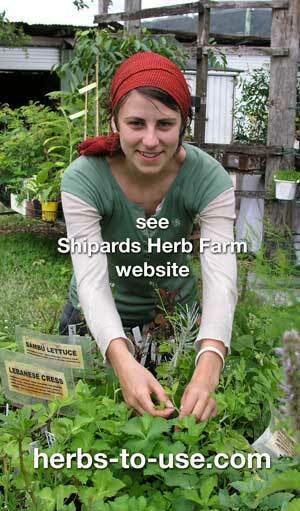 Leave to steep eight hours or overnight. Pour off one half to one glass of the aloe infusion and drink first thing in the morning and also the same amount before each meal and at bedtime if desired. After draining the infusion from a jar, refill the jar with water. This is where it is beneficial to have several jars prepared, so that the jar just refilled goes to the back of the shelf in the refrigerator, and the jars are continually rotated. This allows enough time for each jar to steep before being used. The infusion can be drunk whenever you feel thirsty. After 10-12 days, the used aloe can be emptied into the compost, and a new batch started with fresh leaves. If the jars are not used for a number of days the liquid may ferment. Discard and start a fresh batch. Each time the jars are refilled, the infusion will get milder and weaker, but it will still benefit the body. The flavour is mildly bitter during the first days, but then the infusion will taste like crystal clear spring water. In fact, many people use this method of infusion to purify drinking water, particularly in countries where water is untreated. Some people use this procedure to remove the chlorine taste from treated water by placing a peeled chunk of aloe (with the yellow sap washed off) into a large jug of water in the refrigerator. As liquid is taken out to drink, the jug is topped up again. After several weeks of use, a new chunk of aloe can be started in a clean jug of water. Aloe vera may be prepared as 100% juice, stabilised with vitamin C. Pick large leaves, cut the skin off, rinse the yellow sap off with water and place the clear gel in a blender. For 3 cups of gel, add 1 teasp. of vitamin C powder and blend at low speed. Place in a covered container in the refrigerator. Take 2-5 tablesp. daily, mixed with water or added to fruit juice, which helps to disguise the gooey texture and makes it easier to swallow. The pure juice, taken regularly, is recommended as the most effective way to reap the medicinal benefits of aloe. 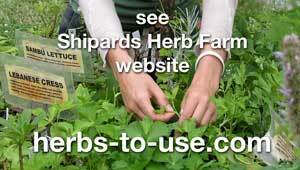 I remember a lady who joined a herb course and heard of aloe’s benefits for ulcer sufferers. She decided to start her family on aloe and each morning prepared fresh orange juice, adding the stabilised aloe juice she had made up. She did not tell her family about the aloe, as they tended to be rather finicky when it came to new things. After several months, her husband remarked that his stomach ulcers had not been bothering him for a while. Margaret kept her secret to herself and enjoyed having a happier husband without ulcers always niggling, but she told her story to me with delight and we had a good laugh together! For anyone not in a position to grow aloe vera, numerous bottled brands of aloe juice or drink are available. However, even though the label may say 100% aloe juice, the bottle may not contain only aloe! Large doses of aloe at one time are unwise. Overdose can cause irritation to the stomach with diarrhea and vomiting. As taking aloe may stimulate uterine contractions, it should be avoided during pregnancy. And taken by breastfeeding mothers, aloe can have a laxative effect on the baby. If taking aloe vera causes cramping of the bowels, use a little ginger with it. The ginger can be in the form of dried powder, fresh or an infusion made with fresh root. For a laxative effect, in some people, just drinking the aloe infusion or the stabilised juice may be sufficient. For severe constipation, the yellow sap may be left on when blending the gel, as it is this yellow sap that has a strong cathartic action and tastes very bitter. If a person finds the bitterness too unpleasant, the yellow sap can be added to fruit juice. Over the last 20 years, I have had numerous people share with me an aloe recipe for cancer treatment. 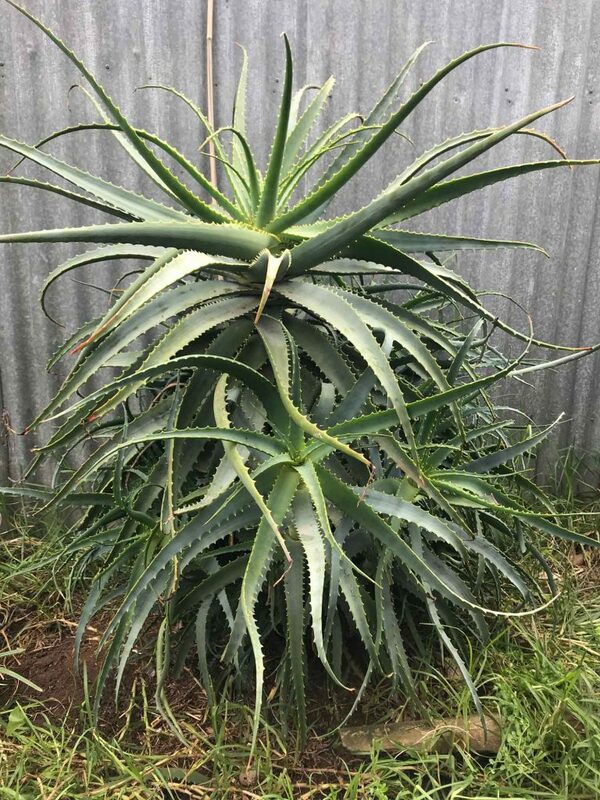 Most of these recipes refer to using the candelabra aloe (A. arborescens) and have come from various South American or European cultures, where it has been a tradition to use the recipe regularly as a general tonic for good health. 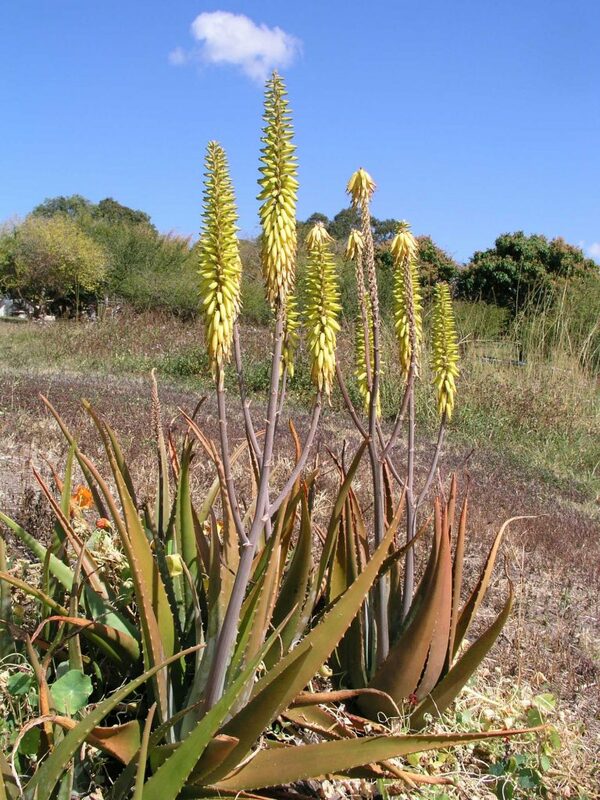 Candelabra aloe has a rather special substance called Aloctin A, found in quantities that can stimulate biological activities, such as mitogenic activity of T lymphocytes, with scientific research showing its strong performance in boosting the immune system. In cancer patients, immune modulating polysaccharides increase the body’s production of tumour necrosis factor, which is a natural chemical that functions to shut off the blood supply to malignant tumours. Another aloe derivative, Alexin B, possesses powerful anti-cancer activity against lymphocytic leukemia. 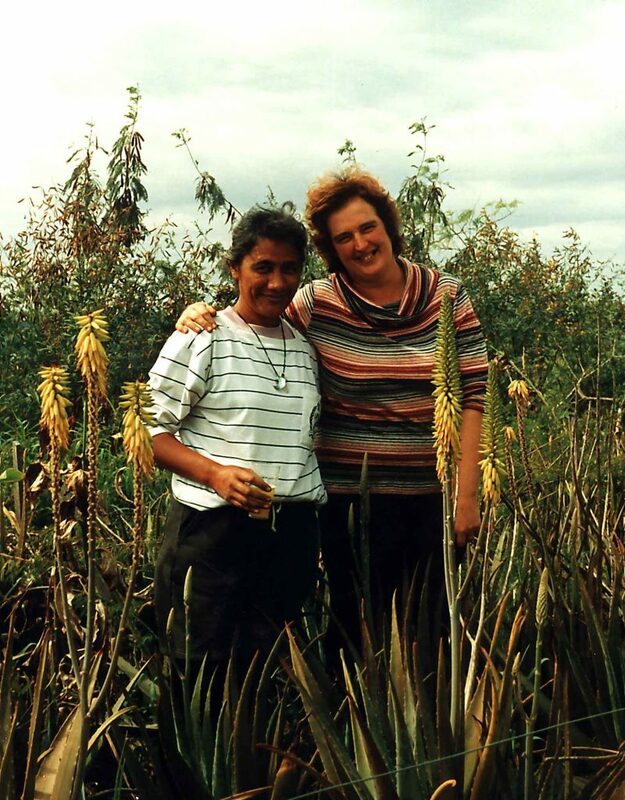 We may hear more about candelabra aloe in the future, as the herb farm was recently able to assist a research group by air-freighting 2000 plants to Sardinia to be grown for research. To prepare the Candelabra Tonic Recipe mix finely in a blender or mincer whole candelabra leaves to weigh 350g, add 500g of natural honey and 50ml of brandy, whiskey or cognac. It is recommended that a sharp knife be used to cut off the sharp spines along the edge of the leaves, and that the leaves be chopped into chunks before putting in the blender. Put the blended up mixture in a dark bottle and keep in refrigerator. The daily dose is 50ml of the tonic with 1⁄2 cup of water taken half an hour before breakfast, lunch and the evening meal.